Copenhagen — As of 12:30 am on 19 December, the latest draft text for the Copenhagen Accord has too few quantifiable targets for our team to adequately analyze it. We look forward to using C-ROADS to calculating the long term impacts of the Accord as soon as possible. 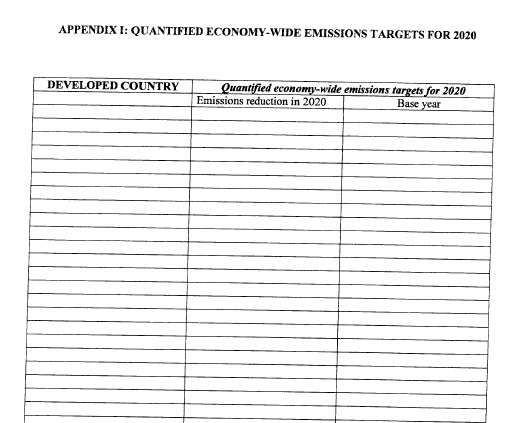 Note that, as we explain here, the Climate Scoreboard presents the aggregate impact of national proposals, not the Copenhagen Accord. however, please keep up the pressure on all concerned to better the deal , so that all those in poverty may be able to see ‘ light at the end of the tunnel ‘. Good and fair leadership , at all levels. Adaquate infrastructure, especially rail & roads. Good maintenance of the infrastructure. Fair wages for the landless + food for work programmes. Security of Land Tenure , no mis-appropriation of land. No shadey deals with Multi-national Companies or Foreign govts. Good marketing systems without cheap imports, especially of FOOD. Food sovereignty for each country. Adequate storage facilities for times of famine/flood etc. Health services & schools in all areas. I may have left out a few important aspects, but if families are secure in their traditional areas & are encouraged to produce the food etc that the country needs, then there can be a ‘ natural ‘ growth & development that is both sustainable & productive.